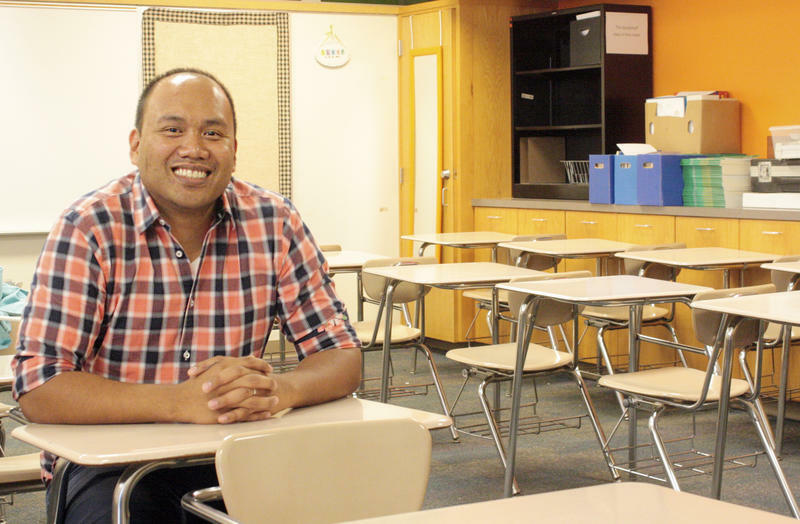 He Was Oklahoma's Teacher Of The Year, Then Moved To Texas For Better Pay. Now What? 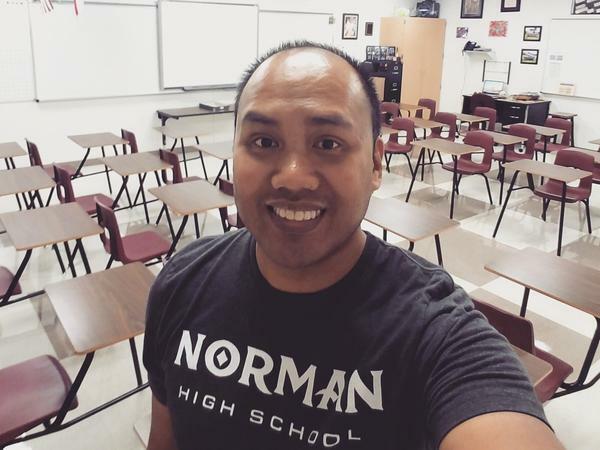 Setting up his new classroom in Texas this school year, Shawn Sheehan took a selfie for social media to wish his home state well. "Wishing all my Norman and #oklaed fam a great school year! Representing y'all as I set up my classroom in Lewisville, TX!" All this week schools across Oklahoma were closed as public school teachers rallied at the state Capitol for better pay and more money for the classroom. After 10 years of budget cuts and some of the lowest teacher wages in the nation, teachers say they've had enough. Pay in Oklahoma has been so low, in fact, that districts often suffer from severe teacher shortages — many talented educators have left Oklahoma for better pay elsewhere. Some estimates put the number of teachers who have left near 2,000. One of those is Shawn Sheehan, Oklahoma's 2016 Teacher of the Year. In 2016 he was so fed up with a lack of funding that he ran for a state Senate seat. He didn't win, and eventually said he could no longer make ends meet in Oklahoma. This school year he and his wife, who is also a public school teacher, moved to Texas for better pay. We caught up with him to ask what he thinks about the teacher walkout in his home state. This interview has been edited for clarity and length. What are you hearing from your former fellow teachers in Oklahoma about the walkout? Leading up to it there was much apprehension. I think people were really terrified of the idea of just leaving the classroom. That's really scary for teachers to leave the comfort of teaching and step into the Capitol building and advocate for our work. 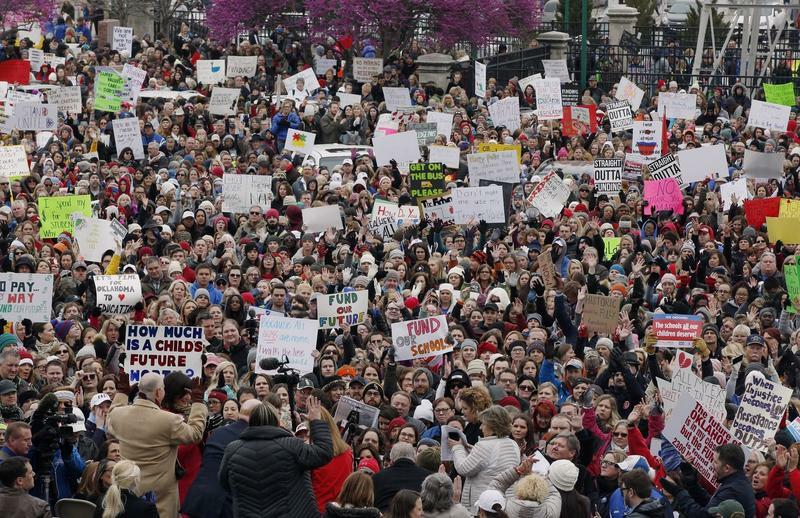 But then I think there was comfort in numbers, and that unity and solidarity among educators in Oklahoma is everything. It counts for so much. How are things in Texas? My wife and I work in a well-funded district. We've got all the resources we need, an excess really. We're being paid a livable wage, a little better than a livable wage. And we get to do the job we love to do without the stress of wondering if we can put food on the table. I'm 32 years old and this is the first time I've had financial stability. On the flip side, we are still dealing with a very heavy testing culture. And so that's kind of one of the struggles. So Texas is not the promised land, but it is more friendly to public education and school teachers. Texas doesn't have the right to walk out the same way Oklahoma does, do you feel like pay is fair in Texas? 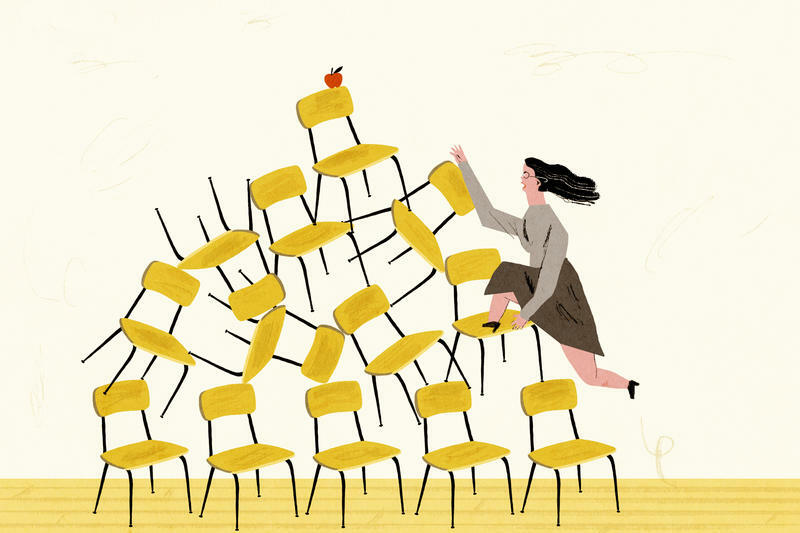 It varies pretty widely across school districts and to me that's an advantage, that school districts are competitive with their pay and that they know to recruit and retain the best educators they've got to offer competitive salaries. That's a good thing. That's a luxury that Oklahoma doesn't have, unfortunately. And then, if I wanted to get behind a movement to change things, there are very active teacher groups that I'm a part of. So, there may be some slight differences in the approach, but you've still got some pretty strong advocates in public education in both states. On Twitter, you recently said that despite all of the problems teachers have, that you still believe you have the best job. Why? Because we get to raise up this next generation of kids. We're seeing it already. We've seen the high school students from Parkland, [Fla.] really stepping up and speaking their minds and bringing attention to the issues of gun violence. Those kids are like the ones that I work with every day. My kids aren't on camera or anything but they're just as passionate, and they're just as certain that they're going to change the future and make it better, and I love being a part of that. There are very tangible rewards. I see my kids out the community working, being productive. I see them volunteering, just doing great things. And that's an immediate pay off that I think is lacking in other professions. Would you come back to Oklahoma if things changed? The outside Okie educators that have left the state, we're watching with admiration and respect, supporting in any way that we can. Because a lot of us are wondering deep down if it's possible for the climate in education to get better so that we can come back home. If there were certain things in place we would come back, primarily funding for schools. Really, for our daughter. We couldn't picture her being in those schools. We knew individual teachers that she would be solid with, but we didn't want to gamble 12 years of her education. The likelihood that she would be with an emergency certified educator was just too high. And the likelihood that her fine arts program or her favorite teacher would be cut, was too high. I hope that the educators know that the public supports them. From an outsider looking in, all eyes across the country are on Oklahoma. And it's a battleground for public education funding. We're seeing this play out on a national level, and across the states, where conservative policies that aren't friendly to public education aren't working. And so it's nice that educators are fighting back against that, and saying we need to right the ship so that we can do what's right for these kids. And Oklahoma has taken center stage in that fight. Hats off to them. Emily Wendler is the education reporter for StateImpact Oklahoma. About exactly a year ago we brought you the story of Shawn Sheehan, Oklahoma's 2016 Teacher of the Year. At the time, he and about 40 other educators were running for office in the state, wanting to make a change because, as Sheehan puts it, lawmakers weren't prioritizing education. Funding for schools in the state has been cut tremendously over the past decade and teachers in Oklahoma are some of the lowest paid in the country. State Education Budgets Across the Country Are in Crisis. Here's Why. This week, striking teachers across Oklahoma have been following in the footsteps of their counterparts in West Virginia. Their grievances, like those of so many teachers across the country, focus not only on low wages but the general lack of funding from the statehouse for basic operational costs. Public schools are dealing with a shortage of supplies, outdated textbooks, poorly maintained buildings, and in some cases, a four-day school week. 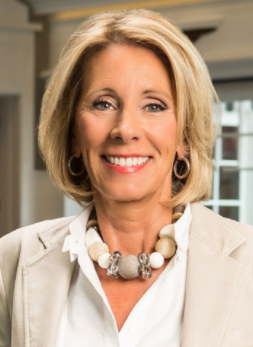 Betsy DeVos, who is President-elect Donald Trump’s pick for education secretary, has given millions in campaign contributions to politicians across the country. You can normally find Shawn Sheehan teaching math and special education in Norman, Oklahoma, just south of Oklahoma City. But school's out for the summer and instead, he's knocking on doors. One-by-one he's asking voters in the state's central Senate District 15 to cast their vote for him. He's running unopposed in today's primary as an Independent, and after the polls close he'll know his Republican opponent.